This exhibition showcase was developed to introduce the pioneering Ambient Experience for Healthcare program to the marketplace. This program is designed to reduce the stress and claustrophobic effects of an MRI through the utilization of a complete multimedia environment that adapts to individual patients. 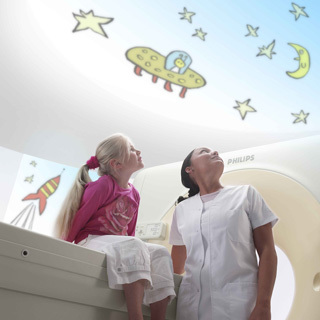 As soon as patients enter the MRI department, they are automatically identified by the system and the environment changes to match their personal specifications. Music and images displayed, as well as the entire lighting and ambience of the room can be customized. The company's exhibition at the RSNA show helped to sell the concept to numerous hospitals around the world.